Do any of these names mean anything to anyone:- Victoria Wallace, Vera Brown, Shirley Porter, Sundray Tucker, Freddie Pool, Janet Harmon, Linda Turner, Sonia Goring, Cynthia Garrison, Rhea Harris or Helen Scott? Miquel Brown, who had a couple of minor hits in the 80s with He’s A Saint, He’s A Sinner and Close To Perfection I could throw into the mix. Any guesses? No. Ok, what about Valerie Holiday? OK, I’ll give you a clue, Valerie has been a member of this trio since 1967 and is still with them? OK, the final two names might give it away; Fayette Pinkney and Sheila Ferguson. Aha, I hear some of you say. 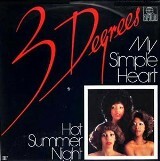 Indeed they are the 15 people who, at one time or another, have been a member of the Three Degrees. Thankfully not all at the same time otherwise they probably would have been called the 15 Degrees. Too hot for me. In 1963, Shirley Porter, Fayette Pinkney, and Linda Turner were singing in small clubs in their hometown of Philadelphia, Pennsylvania when they were spotted by a producer and songwriter called Richard Barrett who had previously discovered and then promoted both Frankie Lymon & the Teenagers and Little Anthony & the Imperials. He was also a member of a group himself, The Valentines. Richie, as he sometimes known, also co-wrote and recorded the original version of Some Other Guy which became a UK hit in 1963 for the Liverpool group The Big Three. In 1965 both Porter and Turner and were replaced by Helen Scott and, at different times, any of the names mentioned at the beginning of this piece. Barrett had his own Swan record label and signed Sheila Ferguson as a solo artist but in 1967 Scott announced she was leaving to start a family and so Richie asked Sheila if she wanted to temporarily take her place – she stayed for 20 years. By the late sixties Richie had got them a recording contract with Neptune records which was owned by songwriters Kenny Gamble and Leon Huff which in 1971 led them to make a cameo appearance in the film The French Connection. Two years later he negotiated a contract with Philadelphia International records but under the guidance of Gamble and Huff. The hits started coming firstly with Year of Decision in April 1974 and just two weeks later they were the featured singers with MFSB on the track TSOP (The Sound Of Philadelphia), the theme to the US television programme Soul Train and made number 22 in the UK but hit the top in America. Their next hit, When Will I See You Again became their biggest hit in the UK when it reached number one in August, but was to be their final US hit peaking at number two. They were everywhere on television and within a few weeks every newspaper in the country were announcing they were Prince Charles’ favourite group. The trio notched up 13 hits in the 1970s with the final one being My Simple Heart which was overseen by two top Italian producers, Giorgio Moroder and Harold Faltermeyer and first recorded by a British soul duo called The Dukes which comprised of songwriters Dominic Bugatti and Frank Musker who hauled in some of the most prolific musicians to produce a rich, evocative sound. The musicians included Toto’s Jeff Porcaro and Steve Lukather, Randy Brecker, The Average White Band’s Hamish Stuart and the backing singers were Robin Beck and Marcy Levy (Marcella Detroit) and the whole thing was produced by Arif Mardin. You may well recognise material written by Musker and Bugatti, in 1981 they wrote a track for Chaka Khan which had little impact at the time, but Frank explained how it paid off years later, “I was sent a cassette by EMI and asked to approve this sample. I listened to it, said yes okay and chucked it in the bin, thinking this would never be a hit. Came back from a summer holiday and it was number one in 22 countries. The guys from Daft Punk had heard something that they liked in the introduction of Fate, the guitar riff. It was a guitar riff that Dominic and I had come up with on the original version of Fate. They had sampled it and looped it and then sung their own song over it. Even Madonna used it on Holiday. There was a bootleg version of Holiday which someone had done where they had taken the vocal of Holiday and put it together with Music Sounds Better with You. She being very very hip did a world tour where she did Holiday in a medley with Music Sounds Better with You. It gave it a different kind of angle. Madhouse did a version of Holiday with the Music Sounds Better with You riff, and that riff spawned hundreds of copycat songs, but you can’t sue everybody can you? After 1987 Dominic Bugatti became a bit reclusive and doesn’t seem to want to be interviewed. Even a trawl around the internet reveals virtually nothing. Frank, however, carried on writing songs and had a few hits in the nineties with Senza Una Donna (Without a Woman) (Zucchero and Paul Young), Too Much Love Will Kill You for Brian May and then Queen – the latter receiving an Ivor Novello award. In 1997, he co-wrote four tracks with Robert Miles for his album 23am including the hit single Freedom which reached number 15. The following year Frank became a director as BASCA – the British Academy of Songwriters, Composers and Authors.